you may rinse quinoa first, but I not. To Cook: start boiling the soaked quinoa in its original water. Once at a boil, cover and turn down to low and cook for 15 minutes. take of the stove and wait for at least 5 minutes… then, lift lid and fluff.. the quinoa should have opaque tail. sprinkle garlic powder, nutritional yeast, pepper and salt also, add chopped finely garlic and onion chives into the mixture and mix. 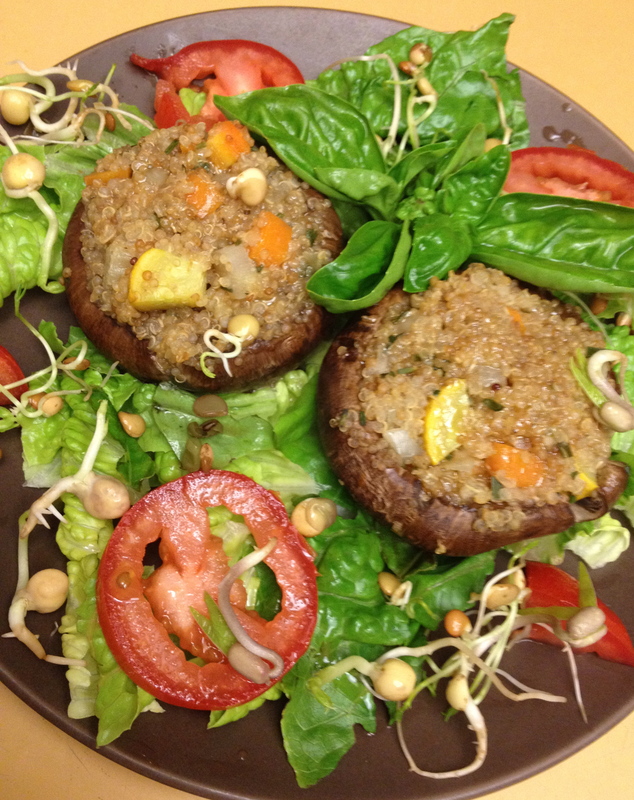 place the stuffed mushrooms in the baking dish and cover with foil. once oven is hot, bake for 2–25 minutes. place them on the plate and serve hot. You can purchase a sprouting jar (available at most health food stores) or you can make your own. To make your own get a 1/2 gallon clear glass container or what ever glass container that you have. Be sure to wash it out well. Cover the mouth with a fine screen, or coffee filter and use a rubber band to keep it on. That’s it. Really though, the purchased jars are inexpensive and are made just for the purpose. 1.) 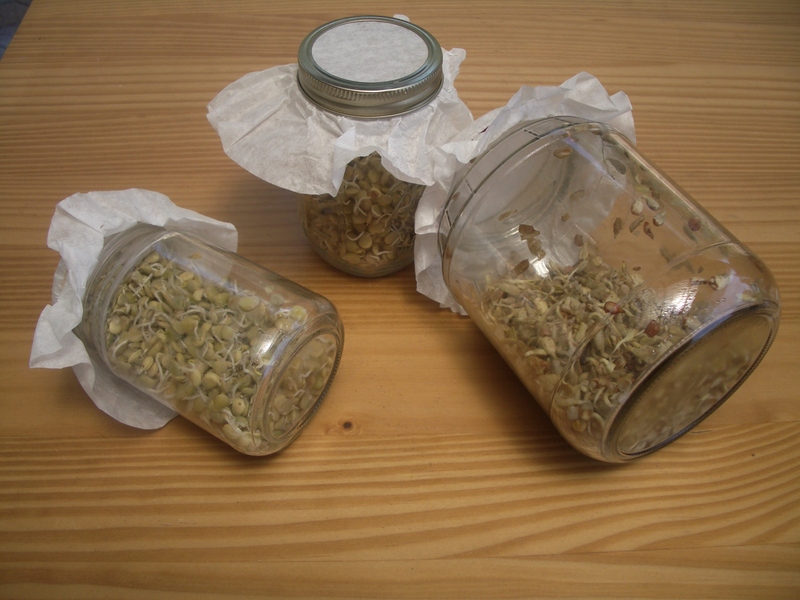 Place measured amount of seed, beans, or grain into sprouting jar. Add water and soak overnight following chart recommendations below. 2.) Pour off soak water and place jar mouth down at 45 degree angle for drainage and ventilation between risings, then rinse twice a day with fresh cool water. 3.) After sprouts have matured place them in a bowl of water. Seed hulls will float to the top and sprouts will sink. Skim hulls off with your hand and discard them. Gently remove sprouts from bowl and drip drain before storing them in a glass or plastic (closed) container or bag in the refrigerator. ** Sprouting tip The ideal sprouting temperature is between 65~ and 75~. Sprouts grow best in darkness or indirect light. When sprouted too long some seeds and beans may become bitter. Grains become sweeter on the fourth and fifth day of sprouting. Start new seeds every 3 days for a continuous suppy. ** Other seeds that can be sprouted include adzuki bean, almond, amaranth, annatto seed, anise seed, arugula, basil, brown rice, navy bean, pinto bean, lima bean, broccoli, buckwheat, cabbage, canola seed, caragana, cauliflower, celery, chia seed, chickpeas, chives, cilantro (coriander, dhania), clover, cress, dill, fennel, fenugreek, flax seed, garlic, hemp seed, kale, kamut, kat, leek, green lentils, lupins, pearl millet, mizuna, mustard, oats, onion, black-eyed peas, green peas, pigeon peas, snow peas, peanut, psyllium, pumpkin, quinoa, radish, rye, sesame, soybean, spelt, sunflower, tatsoi, triticale, watercress, and wheat berries. 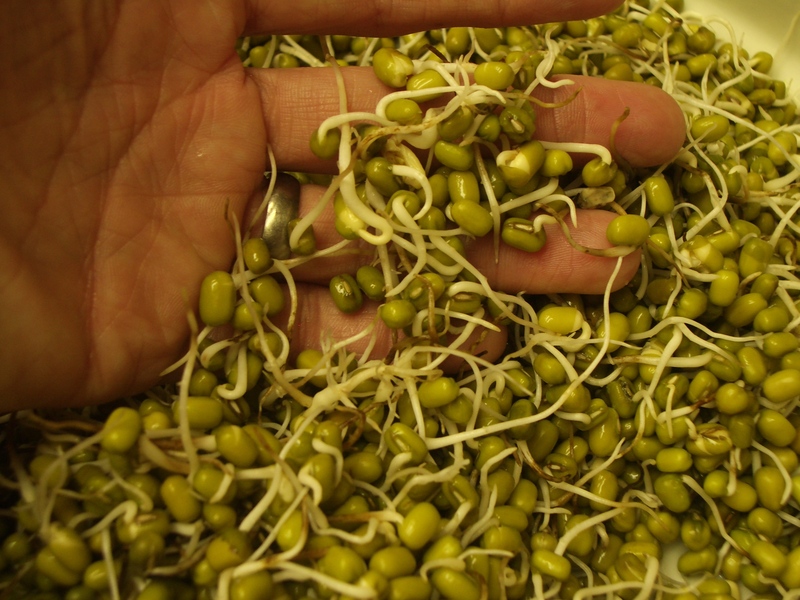 ** Sprouts are rich in digestible energy, bio available vitamins, minerals, amino acids, proteins, beneficial enzymes and photochemical, as these are necessary for a germinating plant to grow . These nutrients are essential for human health. The metabolic activity of resting seeds increases as soon as they are hydrated during soaking. Complex biochemical changes occur during hydration and subsequent sprouting. The reserve chemical constituents, such as protein, starch and lipids, are broken down by enzymes into simple compounds that are used to make new compounds. Sprouting grains causes increased activities of hydrolytic enzymes, improvements in the contents of total proteins, fat, certain essential amino acids, total sugars, B-group vitamins, and a decrease in dry matter, starch and anti-nutrients. The increased contents of protein, fat, fibre and total ash are only apparent and attributable to the disappearance of starch. However, improvements in amino acid composition, B-group vitamins, sugars, protein and starch digestibilities, and decrease in phytates and protease inhibitors are the metabolic effects of the sprouting process.